Six year old Krisel is a blind girl of Filipino origin. Born in the back room of a house in Israel, she was deserted by her birth mother. Together with her adoptive mother, Janette, a foreign Filipino worker, they try to bridge the gaps of language and culture amid the harsh reality of their lives. They persist in a country that one regards as her homeland while the other feels like a stranger. Krisel has no legal status or birth certificate and does not want to go to the Philippines, but operating on one of her eyes will improve their chances of remaining in Israel. And time is running out. 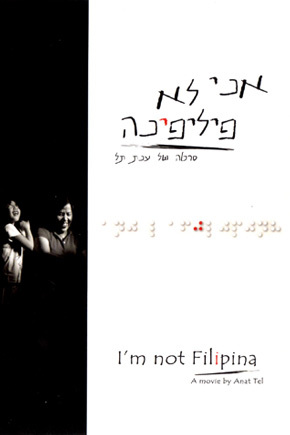 I Am Not Filipina us about a mother and her adopted daughter and the fate that binds them together. Anat Tel Mendelovich holds an MFA from the Film and Television Department of Tel Aviv University. She worked as a producer on Israeli Channel 8 and as script manager/assistant director in several productions. Her documentary debut I'm not Filipina was broadcast on Yes and on Channel 2, screened at festivals around the world and received several awards.